– What are the requirements and exams for an MBA abroad? – How much are the costs of attending a foreign MBA in USA, UK? After completing an MBA in a foreign country (and flirting dangerously with the poverty line), most Indian students would like to work overseas at least for a few year to repay the education loan before coming back to India. Which is why the two earlier questions generally go hand in hand. We look at the top MBA countries for Indian students aspiring to not only study in a good foreign MBA program, but also increase their chances of getting an MBA internship and post-MBA jobs in the same country. There’s no scientific methodology here. It’s primarily based on the requests that we get from MBA applicants working with us and the reasons they cite. 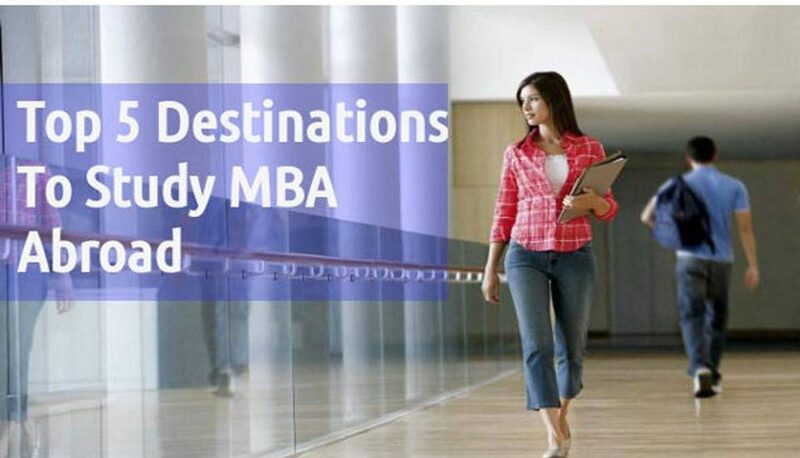 Listed below are the top international education destinations, giving you ample choices to fulfill your dream of studying MBA abroad. This is where it all started for the MBA. It’s not surprise then that all these years later, an MBA in USA tops the charts for international (not just Indian) students. If you consider the infrastructure, resources and opportunities, America is the numero uno choice for a huge majority. For students from India, there are a few reasons why USA is the best country for studying an MBA. There’s a large NRI population that’s been living in American for a long time (several generations in some cases). That means you have easy access to Indian stores, culture and people. Home sickness is easier to deal with. American Bschools have deeper pockets. Many of the MBA abroad scholarship stories (ranging from partial to full 100% tuition fee waivers) our clients have shared on this blog are from MBA programs in the U.S.
To get into US B-schools, the quality of work experience is given a bit more preference over academic records. The United Kingdom has always been the favorite study abroad destination among Indian students. London is one of the leading finance and banking centers, and other cities of UK offer excellent opportunities in the services industry. This reflects in UK business schools’ international reputation not only through a rigorous academic approach but also through high salaries and excellent job opportunities after graduating. In fact, in 2007 UK’s business schools taught more MBAs per year than the rest of Europe put together, according to a British Council research document. The fact that the UK has a strong Indian population base is what makes this country an attractive destination for Indian students, as students traveling from India find it a lot more comforting to be around people with similar background. Though it’s been on the receiving end in recent times due to its new visa regime and the growing uncertainty about getting MBA jobs in the UK, England is still a good choice for folks looking for shorter duration (one year MBA) programs. Many good MBA programs are in or around London, the big hub of global business activity. Almost all the top international companies have a presence here. The biggest MBA brand in the UK comes from London Business School. Then if you’d like to get the university brand to work for you as well, the ‘Oxbridge’ brands – Cambridge (Judge business School) and Oxford (Said Business School) are strong contenders to consider. Other good MBA colleges in the UK are Manchester Business School, Cranfield, Cass Business School. Canada is a popular destination for MBA as it promises much more than just good education. Its economy is thriving in industries like oil & gas, mining, manufacturing, agriculture, and forestry. The impact a good economy has on student life can be felt once you finish your degree, and are at the stage of looking for jobs. Easy availability of good jobs and immigration possibilities is what makes Canada such an attractive place to study at. The big carrot that Canada offers MBA students is work permits, ranging from 1-3 years. Of course, that doesn’t guarantee a job. But it does offer the big psychological comfort of not getting kicked out of the country after spending a whole lot of time, effort and money that’s associated when you are studying abroad for an MBA or MS or Phd. The immigration process in Canada is also relatively simple. For management education, Australia is in a strange spot. When it comes to the second question (about living and working abroad after graduating), Australia offers an excellent standard of living. Just like Canada, it’s got an immigration process that’s friendlier than other countries. There’s no dearth of universities down under, offering all degrees (including MBA courses) and they are all spending a lot of money trying to woo Indian students. And that’s where the challenge lies as well. Despite the huge number of universities and private institutions, the best MBA programs in Australia that have cracked into the international MBA rankings are very few. Apart from Melbourne Business School and AGSM, you are unlikely to see too many other Australian MBA colleges in the list. Being close to India and still offering an international experience in the class, make it a popular choice for cost conscious MBA students from India. In constrast to western countries, the time taken to fly down from Singapore to India and the costs of an airline ticket are manageable. The top MBA programs in Singapore are National University of Singapore (NUS) and Nanyang (NTU). Plus theres a big new draw in recent years – INSEAD Singapore campus. That’s a great way to get a top notch global MBA from Asia and reduce the overall costs. The cost of living in Singapore is lesser than staying in Europe. Singapore is a well-established destination for foreign education in the Asia-Pacific Region. It is one of the most economically viable options if you wish to pursue your education abroad. The total expenditure on fees costs in most educational institutes at Singapore ranges between Rs. 15 lakh and Rs 20 lakh. Students have permission to work for 16 hours a week while pursuing studies to support themselves economically. Got questions for us? Post them below. We’ll help you with some more inputs based on your profile and post graduation plans.